Death holds no fear for the Christian. He knows he will slip through its boney fingers into the arms of Jesus. 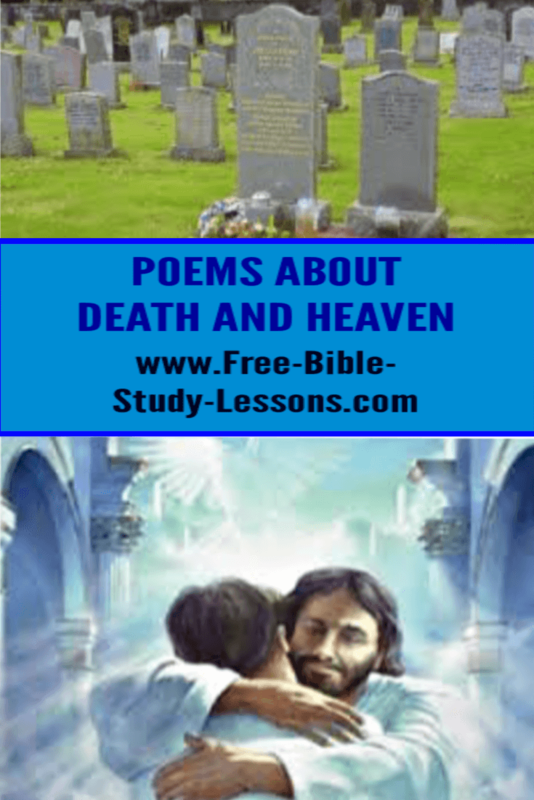 Let these poems about death and heaven be an encouragement to you. But now, proud world, I'm going home. "That day, a day of wrath, a day of trouble and distress, a day of wasteness and desolation, a day of darkness and gloominess, a day of clouds and thick darkness, a day of the trumpet and alarm against the fenced cities, and against the high towers!" --ZEPHANIAH i. 15, 16. Day of vengeance, without morrow! As from Saint and Seer we borrow. And each secret veil is rending! Man to judgment is awaking. When the just are scarce defended? Fount of pity, safety send us! Save me, in that day, despairing! Spare the hope thy labors brought me! Ere the day of dissolution! Hear. O God, Thy suppliant moaning! Bad'st me hope in my contrition. Save me from that endless burning! Thou art from the goals dividing. On Thy right a place abiding! Call me forth with Thine elected! Cure for me when all is ending. Save him, God! from condemnation! The sunset consummation-lights of death. This dull and cumbrous load of clay. The door that leads to endless rest. Where sin and grief can sting no more. Where streams of living waters run! Saying, We are twins in death, proud Sun! The vassals of his will? Upon the stage of men. Or shake his trust in God! All the fight fought, all the short journey through. O, the pain, the bliss of dying! The hour of death may be. To swoon to that--from this. Your joy be the reality. Our suffering life the dream. Is the silent, unknown stream. Which opens to the land we long to know? The things prepared, the cloudless radiance streaming. For Man, the God, shall doom! For thee, O dear, dear Country! And the corner-stone is Christ. The Porter and the Port!" Thou hast no shore, fair ocean! Thou hast no time, bright day! And thine the golden dower! The Life where Death is not. The wealth that is thy King's! What social joys are there! The assembly of the Saints. Are clad in robes of white! And so it is on high. The glory of the Elect! Can sing thee as thou art! Thou City of the Angels! Thou City of the Lord! Who kept the faith below. O fields that know no sorrow! O state that fears no strife! O princely bowers! O land of flowers! O realm and home of Life! O mine, my golden Zion! Exult! O dust and ashes! These poems about death remind us of the fact we will all face it. Study what death really is and more in our course: Death and Beyond.